Michel Tremblay’s Hosanna is still a remarkable play even 33 years after it was first performed. While presenting a gay couple on stage is no longer shocking, Tremblay’s insights into the dynamics the relationship are still keen and he expresses themes of the construction of gender and the effects of cultural colonization more effectively than do most young playwrights today. The disappointment in Pleiades Theatre’s revival, surprising given director/translator John Van Burek’s past work, is the production’s near-total lack of subtext in a play where subtext is all-important. 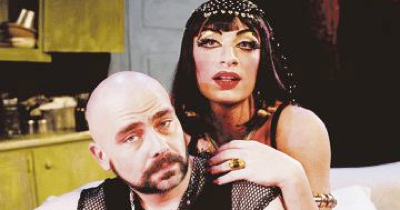 The drag queen Hosanna (Salvatore Antonio), dressed as his idol Elizabeth Taylor in Cleopatra, and Cuirette (Jean-Stéphane Roy), his leather-man partner of four years return from a Halloween party where Hosanna has been publicly humiliated with Cuirette’s complicity. We don’t find out exactly what happened until the end, but from the very start the atmosphere between the two should be fraught with the tension of unspoken rage, pain and guilt. This doesn’t happen. Antonio, uncertain in accent, tosses off lines as if this was his sitcom not his tragedy while Roy plays Cuirette as such a buffoon we can’t see how the two could ever have stayed together so long. The production finds its way by the end, but by then too much of the play’s power has been squandered. Photo: Jean-Stéphane Roy and Salvatore Antonio.